Automatic Store Replenishment is a powerful strategic weapon for retailers. Seven benefits of Automatic Store Replenishment (or Computer Assisted Ordering) and cycle-counting. New features are: Nice Shelf Stock to improve commercially attractive shelves, Counting by Exception to improve data integrity and store productivity and Store Order Leveling™ to improve logistics productivity. This article shows how to benefit from each aspect of Automatic Store Replenishment. How to build high data integrity. What are pitfalls to avoid. How to manipulate ordering parameters. What inventory choices to make: do you prefer minimum inventories or full shelves. And what are benefits of warehouse production leveling and truck-load optimization. A rule-of-thumb is that 1 % out-of-stock results in 0.5 % lower turnover. When products are out-of-stock, retailers suffer from customers buying elsewhere or buying not at all. Manufacturers suffer from brand substitution and also from non-sales. Strong brands show more store-substitution and weak brands show more brand substitution. Effects are different for stores with large assortments than for stores with small assortments. And sales effects of out-of-stocks are limited for both retailers and manufacturers by package-size substitution and delay of purchase. Ordering mistakes by store employees are a main cause of out-of-stocks. Other main causes are delivery delays of manufacturers, out-of-stocks and order-picking mistakes of the central warehouse and the quality of product introduction and deletion. But in-store manual ordering mistakes amount to at least 50 % of out-of-stocks. No manual ordering mistakes is one of many benefits of Automatic Store Replenishment. Why do store-orders improve by Automatic Store Replenishment? Inventory levels at time of delivery are estimated by a forecasting system. The system takes into account any shipments underway and turnover during lead-time from order to delivery. This forecasting is almost impossible by classical manual ordering. But there are some conditions for Automatic Store Replenishment to work correctly. If these conditions are met, lower out-of-stocks will have a positive impact on net profitability. See the next calculation. Potential net profit of out-of-stock reduction by Automatic Store Replenishment = 180.000 for every 500 million of total sales. In my practice some retailers already have low out-of-stocks by solving every order-picking / ordering mistake by extra deliveries, shipments and returns. This solution proves extremely expensive. In these cases net profits from Automatic Store Replenishment are up to 350.000 for every 500 million of sales. Automatic Store Replenishment makes it possible to choose between many different ordering techniques. Most important are “fill-to-minimum” and “fill-to-maximum”. Fill-to-minimum is ordering just enough to stay above minimum stock levels. Fill-to-maximum is ordering for full shelves. Advantage of fill-to-minimum is low average stocks, but disadvantage is a good chance of unattractive looking shelves. Advantage of fill-to-maximum is attractive full shelves, but disadvantages are higher average stocks and increased possibilities of product shrinkage. Highest profit from Automatic Store Replenishment – and every solution to any problem! – is obtained by maximizing advantages and minimizing disadvantages. For store ordering this means: choosing a middle road between fill-to-minimum” and “fill-to-maximum”. You can work with a percentage of each ordering technique, or you can define so-called “nice stocks”. “Nice Shelf Stocks” are minimum shelf stocks to give shelves an attractive look. “Nice Shelf Stock”-levels are often larger than safety-stock levels, which are maintained to avoid out-of-stocks when turnover is extra high. A simple way to define “nice stocks” is: one or two items per facing. Other inventory benefits of Automatic Store Replenishment are “sales anticipation” and “on-order information”. “Sales anticipation” means that the ordering system makes a forecast of turnover during lead-time between order and delivery. This forecasted turnover is added to the order, so shelf-stock is just right when delivery is put on the shelf. “On-order information” takes into account that during ordering a former delivery has not arrived yet. In classical manual ordering this problem is often tackled by lowering order frequencies. Automatic Store Replenishment has no problem with deliveries on route. These are just added to in-store stocks when calculating an order. Potential net profit of stock reduction by Automatic Store Replenishment = 130.000 for every 500 million of total sales. This is excluding opportunities for gross-margin increase. Space for new assortment is created by Automatic Store Replenishment, because fast-moving items often need less facings when stock levels go down. New assortment creates more choice for customers and higher sales. Facings of slow-moving items are not effected by lower stock levels, because facings of slow-movers totally depend on case-size. See article on optimal case-size. Automatic Store Replenishment makes it possible to substitute low-margin sales by high-margin sales. Fast-moving items – especially A-brands – often have very low gross-margins and negative net product profitability. Lower stock levels reduce impulse buying of these loss-leaders. New assortment can be chosen from high margin niche groups. Or you give high margin private brands extra facings to induce impulse-buying. Resulting average gross-margins will rise. If free space is used optimally, resulting net profitability will be higher than net profit from stock reduction. Automatic Store Replenishment reduces labor costs, because manual ordering is substituted by automatic ordering. It is true that new tasks are introduced to maintain correct stock data, but these tasks require fewer and cheaper labor. Counting by Exception is an important feature of Automatic Store Replenishment, which makes cycle-counting even more efficient. Exceptional stock levels trigger counting: zero physical stocks, zero database stocks, zero turnover and vulnerable products. Effect: obvious problems are tackled with a minimum of work. Zero physical stocks are checked to detect order picking mistakes and theft. In takes a few minutes to walk the isles after every shelf filling cycle, and to check empty – or almost empty – shelf spaces and corresponding database stock-levels. Zero physical checks are important: if database stocks are above minimum stock levels and physical stock levels are zero or very low, the ordering system will not generate necessary replenishment orders. Sales will drop to zero. Checking zero (or negative) database stocks is method of choice to manage shelf space for unexpectedly successful products, deleted products, new product introductions and products temporarily out-of-stock. A list of zero stocks is compared with physical stocks every day. This also takes little time. Deviations require some analysis and adjusting of shelf space. Zero turnover checks make it possible to detect problems with product availability and visibility of fast-moving products. If a product is normally purchased 20 times a day, it only takes a few hours to produce an automatic trigger for store management to check if anything is wrong with products on shelf. Zero turnover detection requires sophisticated statistical software, but is a powerful tool to improve attractiveness of the store. Vulnerable products are articles which have a high probability of shrinkage and other causes of stock level deviations. Examples are perishable goods, or small expensive items like cosmetics, cigarettes, batteries and razor blades. These products (or product groups) are pre-defined or are detected by frequent stock level mutations. They are cycle-counted more frequently than normal. The effect is that counting frequencies for “normal” products are limited to a minimum level, and average counting frequency remains low. Potential net profit of labor cost reduction by ASR = € 775.000 for every € 500 million of total sales. High frequency cycle-counting of vulnerable products will detect shrinkage problems in an early stage. When store management addresses these problems, cycle-counting makes it possible to measure effects and evaluate solutions. Placing products behind a service counter to reduce theft by customers and employees. Each solution has advantages and disadvantages. For example: placing products behind a service counter will result in lower sales and higher costs. This is a high price to pay for shrinkage reduction. It is better to develop solutions that increase sales, at the cost of some closely monitored shrinkage. Placing small expensive items next to point-of-sale has two distinctive advantages. We measured the effects in two interesting shrinkage studies. First benefit: increased visibility for POS workers and lower shrinkage. Second benefit: increased visibility for customers and higher sales. Increased visibility is very interesting for high margin batteries and razor blades. These products generate high gross margins (up to 60 % of an average price of € 4,50), and they have a high visibility elasticity or high impulse factor. Customers buy these products when they see them. Batteries and razor blades are the best products to place on a counter or next to point-of-sale. Shelf profitability of this high-opportunity store real estate is much higher then for the usual low-price/ low-margin candy bars. We were able to obtain these results only through the availability of item-level inventory and cycle-counting. 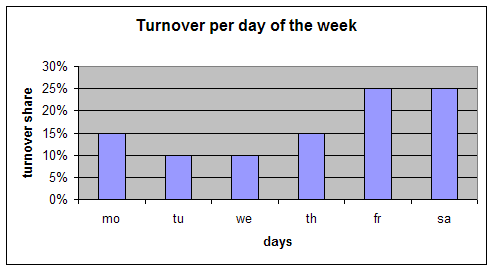 Turnover is not equally distributed over days of the week. More customers shop on Fridays and Saturdays than on other days of the week. These two days together may even constitute half of total weekly sales, as in the next diagram. But every solution creates a new problem. Ordering slow-movers on quite days makes the ordering and distribution system more complex. Pre-producing fast-movers on quite days creates extra inventories in the pipe-line. Maximizing daily orders makes ordering more complex and is cause for increasing out-of-stocks on busy days. The best solution is Store Order Leveling™ by simply manipulating input parameters of the automatic replenishment system. The system uses free shelf space of set-to-minimum order algorithms, or redundant stock levels of set-to-maximum algorithms. 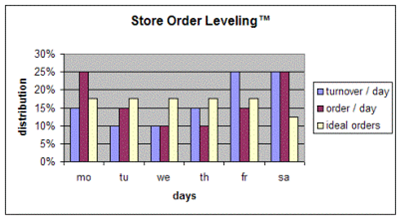 Orders can be leveled to an ideal distribution over days of the week. The next diagram shows flat orders fro Monday to Friday and reduced orders on Saturday. We have made many simulations for set-to-minimum and set-to-maximum order algorithms, and these simulations are tested in real-life situations. It is now possible to generate almost any order leveling distribution for any actual turnover distribution. It is also possible to shift automatic orders further to compensate for manual – non-leveled – orders. Potential net profit of labor cost reduction and truckload optimization by Store Order Leveling™ = € 460.000 for every € 500 million of total sales. Fashion retailers plan their budgets every season for item procurement and distribution to the stores. Logistics is mainly push oriented. Traditionally the leftovers are discounted at the end of the season with high mark-downs. These mark-downs are high because the season is over and leftovers are the least desirable items for regular customers. A system with item-level turnover planning and inventory control makes it possible to monitor sales development from day one. After a few weeks it is clear which items are slower then expected and will not entirely be sold during the season. If price mark-down is started during the season, overall mark-downs will be lower. This is called “quick response”. The earlier a store starts its mark-down program, the lower the overall price reduction will be. See the next table. Profit effects depend on seasonality and fashion characteristics of the assortment. If 20 % of items is normally marked-down on average by 50% at the end of the season, and “quick response” makes it possible to lower average mark-down to 40%, the net profit effect is a staggering 10 million on every 500 million of turnover. There will be some substitution effects in the season, but early mark-down will also improve the price image and customer attractiveness of the store. One additional aspect of “quick response” is the reverse of early mark-downs: additional production and distribution of fast-moving items. If sales of certain items are higher than expected, producers should be flexible and quick enough to produce and distribute these items to the stores in a very short time. Often there is no match between logistics requirements and commercial requirements. For example: logistics managers prefer low distribution costs and low delivery frequencies, but commercial managers prefer low store inventories, low out-of-stocks and high delivery frequencies. An easy solution is a compromise with a heavy weight on store requirements. A better solution is to choose for high delivery frequencies to the stores, in combination with concentrated deliveries by one channel. In other words: minimal “direct store deliveries” and maximum deliveries via the central warehouse. This creates a win-win situation for the stores and for logistics. But high delivery frequencies are not sufficient to prevent a costly problem in the stores. There are always 100 – 150 super fast moving items – with low gross-margins – that still require much shelf space in order to meet customer demand. Large shelf space means high visibility, and high visibility means high impulse sales. And here is the problem: super fast moving items are often loss-leaders: net product profitability is below zero. You do not want to sell these products, but you have to. Extra impulse buying works very negative on the stores profitability and must be avoided. But these items are traffic builders and they must never be out-of-stock, otherwise the store will lose customers to the competition. Item-level inventory control – as part of Automatic Store Replenishment” – makes it possible to maintain low inventory levels and low visibility on the shelf, in combination with an extra backroom stock. The computer will take the two stock locations per item into account, for cycle-counting and ordering purposes. Unwanted impulse buying of loss-leaders is prevented and there is even shelf space available for additional high-margin assortment. Net profitability effects are not easy to calculate, because ”space-elasticity” is different for every item. We also have to make estimates about substitution from low margin to high margin products. But this improvement concept is intuitively promising and can be tested in practice. Potential results of Automatic Store Replenishment are high: 1.5 million hard benefits and another 1 million soft benefits for every 500.000 million of turnover. For fashion retailers potential benefits are much higher, because these retailers have the potential to cut back in expensive price mark-downs. These benefits have a long life span. If you are making an investment decision for SCM software licenses and implementation, use at least a 5 years time span. At 10% DCF, the NPV of hard benefits is 5.5 million. This is about 10 times the cost of a SCM software licence and these benefits may cover the investment of an entire ERP system. These critical success factors must be managed to realize their specified results. This requires assistance from experienced implementers and users of Automatic Store Replenishment. RetailEconomics offers consultancy services to realize full potential benefits of Automatic Store Replenishment, by focusing on critical success factors. We are happy to deliver a detailed plan, based on your specific questions. The case-pack quantity of fast moving consumer products is a battlefield between retailers and suppliers because of conflicting interests. Retailers want small case-pack quantities because they prefer low shelf stocks. Suppliers want large case-pack quantities for lower packaging costs and more shelf space. This is a practical analysis of the effects of case-pack quantity on costs, shelf inventory and profitability. Retail buying managers and supplier product managers will get an actionable understanding of optimal case-pack quantities for fast-movers and slow-movers, large products and small products. They can use this information for product development, price calculation and negotiations. A larger case-pack quantity will improve cost efficiency of suppliers, because box-prices and handling costs are lower per consumer unit. This cost efficiency is an important reason why suppliers prefer large case-pack quantities. 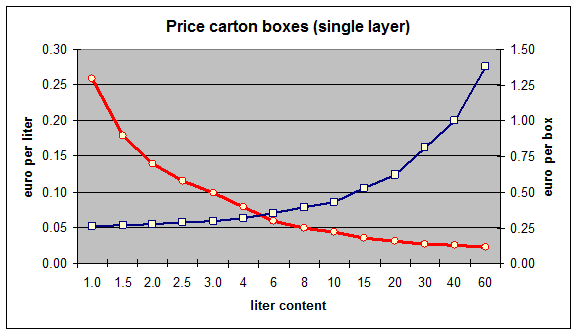 Diagram 1:market prices of single layer boxes and prices per liter content. Diagram 1 shows that small boxes are expensive per liter content: up to 25 cent per liter. Large boxes tend to a low price of 2.5 cent per liter. Handling costs of retailers are lower with increasing case-pack quantities: lower order-picking costs and shelf-filling costs per consumer item. Result is that retailers prefer high case-pack quantities for fast-moving articles, but they require smaller case-pack quantities for slow moving articles. Retailers with large stores generally accept larger case-pack quantities, because large retailers generate sufficient sales per product per store. Retailers with small stores generally require smaller case-pack quantities, but small retailers represent less weight in decision making by suppliers as a result of smaller assortments and lower sales. The case-pack quantity is also the minimum order quantity and delivery quantity of central warehouse to stores. Order costs of retailers are low and are becoming lower by introducing Automatic Store Replenishment or Computer Assisted Ordering. 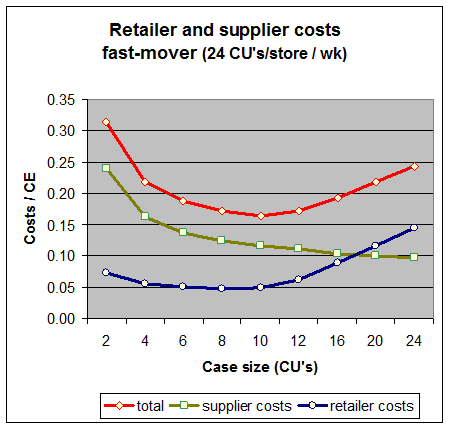 Order costs of retailers are therefore not an important factor in determining optimal case-pack quantity. Large case-pack quantities require larger shelf stocks and shelf-keeping costs in retail stores. This effect is especially significant for slow-moving articles in combination with a high order-frequency. A-brand suppliers make strategic use of this effect to acquire more shelf space and higher visibility in retail stores. This is another important reason for suppliers to promote large case-pack quantities. But retailers generally do not wish to overstock A-brands; they prefer assigning more shelf-space to margin-rich private labels. Low stock-turns due to large stocks of slow-movers decrease the shelf profitability of products, which can be a reason for deleting a product. This effect is not part of the model calculation, to prevent double counting of shelf effects and opportunity costs. In another article we will introduce case-pack quantity as one of the many drivers of shelf profitability. Large case-pack quantities for slow moving articles will also limit the store assortment capacity. If a product uses more shelf space then necessary to avoid out-of-stocks, opportunity costs are involved of missed sales and net profit of product additions to the assortment. In other words: better 2 products than 1 product on 2 facings. Our model will take account of these opportunity costs of case-pack quantity related shelf-space above the logistic minimum. These cost effects determine the optimal case-pack quantity of a product. The key questions are if an article is slow moving or fast moving and if the products are small or large. 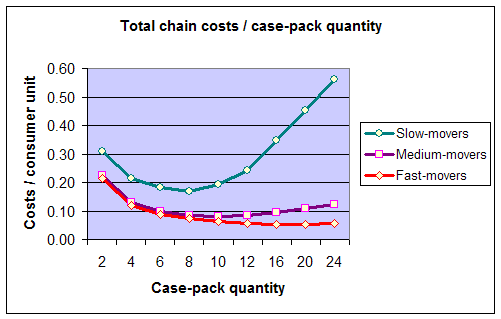 Diagram 2 shows total chain costs as a function of case-pack quantity of a product of average volume. 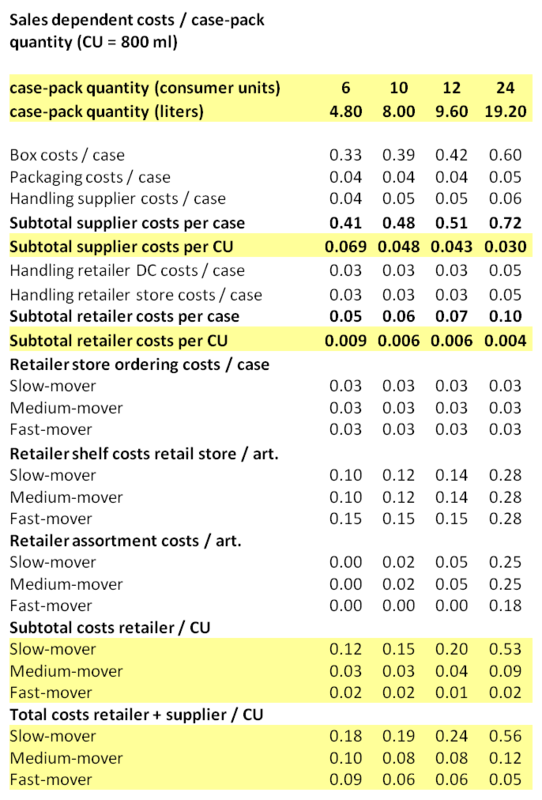 In this example the optimal case-pack quantity for slow movers is 6; optimal case-pack quantity range of fast movers is 12-16, but costs of a wide range from 8-24 consumer units are marginally higher. See appendix 1 for breakdown of cost figures. Retail Economics © 2011, diagram 2. In diagram 2 the product volume is average (800 ml). Appendix 2 contains an overview of the effects on costs and optimal case-pack quantities of small products (200 ml) and large products (4000 ml). Weight per case is a limiting factor: a case should not weigh more than approximately 15 kg for ergonomic purposes. This weight factor is important for most soft drinks, wines, fruit juices and canned foods in consumer units of 1 liter or more. Most beers and canned foods are packaged in smaller weight units, and even a large case-pack quantity will not reach ergonomic weight limits. Weight is not a cost factor and is not part of our model calculations. Unfortunately the turnover of products is not a uniform or static figure: small stores tend to sell less and large stores tend to sell more of each product. Also buying patterns will differ from store to store and certainly between regions and countries. This means that optimal case-pack quantities for one store can be different from optimal case-pack quantities for another store. A break-down of the total chain costs reveals a different pattern for retailers and for suppliers. 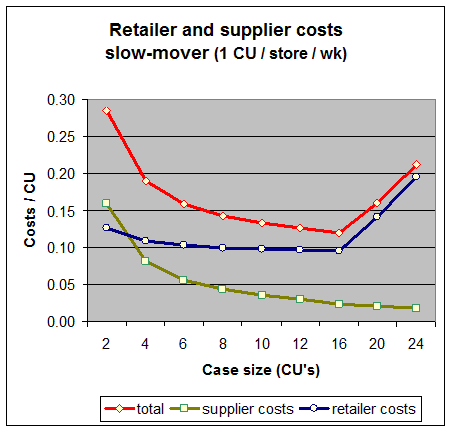 Optimal case-pack quantities for retailers are always lower than for suppliers. Suppliers prefer larger case-pack quantities in the range of 12-48 consumer units. Suppliers are mainly concerned with the packaging costs per consumer unit, which decrease with case-pack quantity. Suppliers experience high total packaging costs for small case-pack quantities, irrespective of the turnover of the product in retail stores. Larger case-pack quantities generate lower costs per consumer unit. For retailers each product has an optimal case-pack quantity, depending on size, weight and turnover of the product. These optimal case-pack quantities are mainly in the range of 6-12 consumer units. Large case-pack quantities of slow-moving food products cause over-facing on store shelves, especially in smaller stores. This over-facing reduces possibilities of retailers to expand the overall store assortment. Over-facing is also one of the root causes of low shelf productivity and reason to delete a product. 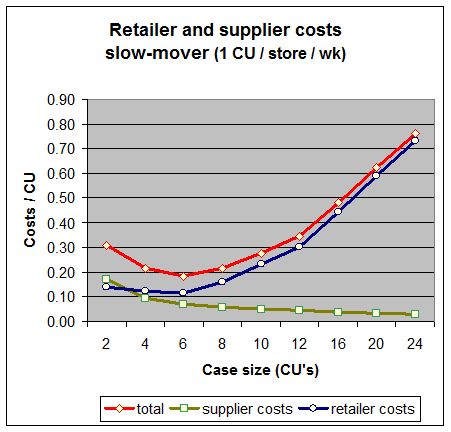 Fast-moving products cause low costs for retailers, irrespective of case-pack quantity; in the example the optimal case-pack quantity is between 8 and 12. Slow-moving products however cause rapidly increasing costs, when case-pack quantities are higher than 6, up to extremely high levels due to high shelf costs and opportunity costs. See diagrams 3 and 4. © Retail Economics 2011, diagrams 3 and 4. Each of these solutions is realistic, but each solution has different consequences for different products. 1. Demanding a smaller case-pack quantity from the supplier is the first and most efficient action. 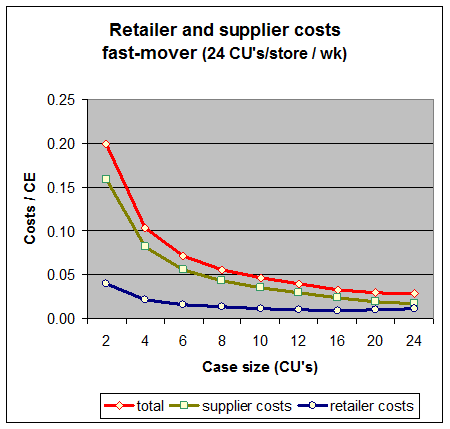 Reducing the case-pack quantity by 50% will cost a supplier 2-3 euro cents extra per customer unit. 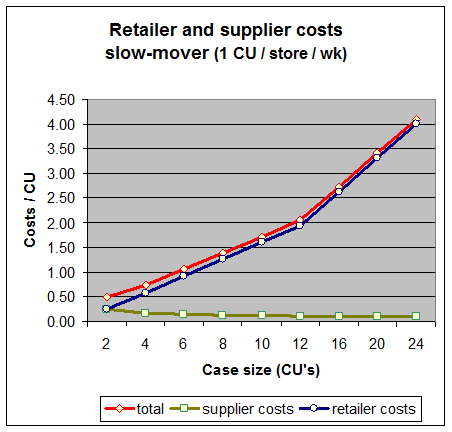 The cost savings for the retailer (including opportunity costs) of reducing the case-pack quantity of a slow-mover (sales of 1 CU/store/wk) from 12 to 6 consumer units is 20 euro cents in the above example; the cost savings of a reduction of the case-pack quantity from 24 to 6 consumer units is even 60 euro cents per consumer unit. Even de reduction of the case-pack quantity from 16 to 8 consumer units of a medium-mover (sales of 6 CU’s/store/wk) is profitable from the point of view of the total chain. The retailer should accept a small price increase of the supplier, because resulting net profit is high. Suppliers will argue that changing the case-pack quantity for one retailer is very expensive. Repackaging or producing extra case-pack quantities is much more expensive than uniformly changing the case-pack quantity. If this solution is selected, several retailers should work together or calculate the maximum acceptable cost increase. Suppliers might also argue that smaller case-pack quantities will decrease the facings and visibility of the supplier brands, and that additional space will be filled with competing brands. This will give retailers some leverage in negotiations: by accepting to fill additional space by products of the same supplier, the supplier will have great encouragement to accept a retailer request. 2. Deletion or refusing slow-movers with large case-pack quantities is a next option for retailers. Retailers might choose a different brand that matches retailer requirements. Such possible action will give retailers even greater leverage. Suppliers should always estimate the relationship between case-pack quantity and potential retail distribution of its brands. 3. Breaking down cases into smaller units in the retailer warehouse is an expensive option, but in practice this is done for expensive cosmetics and fresh deserts with limited conservation time. Retailers sometimes choose to change order quantities to 1 consumer unit, and then deliver single items in crates to stores. 4. Storing redundant articles in the backroom of stores is not the best alternative for slow-moving food products. It will make it possible to present slow-movers on 1 facing, but it confuses inventory control and introduces large extra handling costs. 5. Increasing number of facings of slow-movers is very expensive because of high opportunity costs. Each extra facing for a product reduces space for other products on the shelf. More than 1 facing for slow-movers will greatly decrease stock-turns and increases chances that a product becomes obsolete. This option is only feasible when products generate high absolute gross margins and if products also show high space elasticity (if an extra facing of the product generates more sales than introduction of a new product). Retailers and suppliers should work together to choose optimal case-pack quantities for average stores. Small stores will delete or will not introduces slow-moving products with large case-pack quantities, but they might accept medium case-pack quantities. 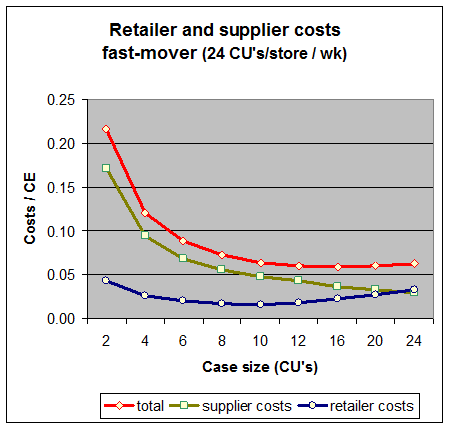 For large stores additional costs of a smaller than optimal case-pack quantity are very small. The advantage of a smaller than optimal case-pack quantity is the flexibility in applying alternative ordering algorithms. See appendix 3 for the effects of alternative ordering algorithms on logistic performance and stock-keeping costs. Retailers and suppliers should use ECQ modeling to determine the cost effects of a change in case-pack quantity, in order to renegotiate product price. This article gives proof that there is room for profit improvement for both parties, when they optimize case-pack quantities from total supply chain point of view. In another article we will include these costs in determining the net shelf profitability of products, as a function of many drivers including case-pack quantity. Our shelf profitability model also includes the effects of consumer price, gross margin, space elasticity and substitution effects. These additional factors are omitted in the ECQ model, because they have very limited effects on optimal case-pack quantities. The product in the example is of average size, average price and average gross margin. Real figures – including the optimal case-pack quantities – may differ when products are smaller or larger. Staple possibilities also increase optimal case-pack quantities, because extra consumer units are stored at one facing. If volume of a product is only 200 ml, more consumer units fit in one facing and optimal case-pack quantities will increase. If volume of a product is 4000 ml, less consumer units fit in one facing and the optimal case-pack quantity will sharply decrease. See the next diagrams. Example: small product (volume = 200 ml). © Retail Economics 2011, diagrams 6 and 7. Example: large product (volume = 4000 ml). © Retail Economics 2011, diagrams 8 and 9. In this article we use the ordering technique of “fill-to-maximum”. We exploit the full shelf capacity for safety-stock plus cycle stocks. “Fill-to-maximum” ordering techniques are simple and are used for manual ordering, but they lead to relatively high inventories. If we use Automatic Store Replenishment (or Computer Assisted Ordering), it is possible to use “fill-to-minimum” ordering techniques, in combination with anticipation of sales during order lead-time. It means that we only stock our shelves with consumer-units which are sold between deliveries. We also take account of sales forecasts during lead-time of orders, based on historic sales data. This improved technique will deliver lower inventories and lower stock keeping costs, especially for slow-moving and medium-moving products. Effect of “fill-to-minimum” ordering on optimal case-pack quantities of slow-moving and medium-moving products is an increase of the optimal case-pack quantity. This improvement is approximately 30 %: from 6 to 8, and from 8 to 10. This effect is the result of lower safety-stocks (better sales forecasting) and lower cycle-stocks (only sales have to be reordered between deliveries but not during lead-times). If we maintain “old” case-pack quantities, shelf capacity for single products can be reduced, resulting in the reduction of facings for part of the assortment and a reduction of stock-keeping costs for the entire assortment. An even more interesting result of “fill-to-minimum” ordering is the possibility to use free shelf capacity during days with low sales (Tuesday, Wednesday and Thursday) to equalize production flow in retail warehouse and store. See article on Automatic Store Replenishment. 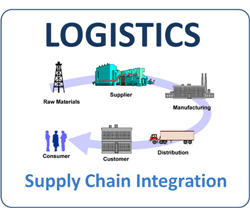 This article is the analysis of current developments in the field of supply chain strategy. Our recommendations give direction to food companies to become “excellent service organizations”. Modern food retailers and manufacturers are becoming more and more market driven. A clear sign is the succes of Efficient Consumer Response.